Last year my 3-year-old wanted to have a My Little Pony party. 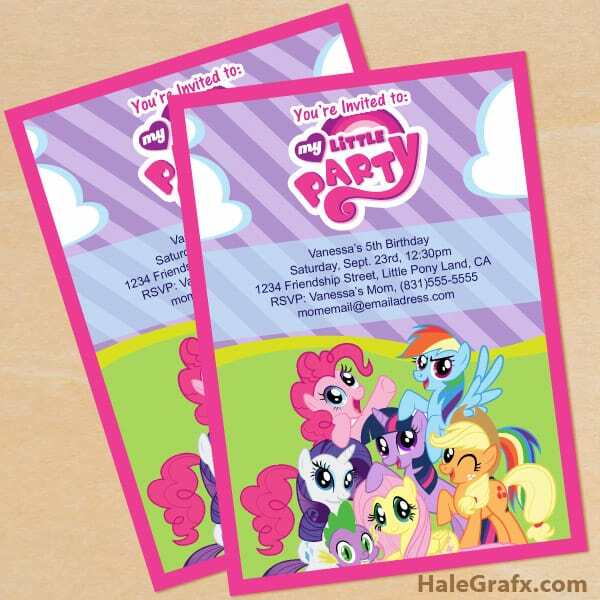 This year, you guessed it, she wants a My Little Pony party! 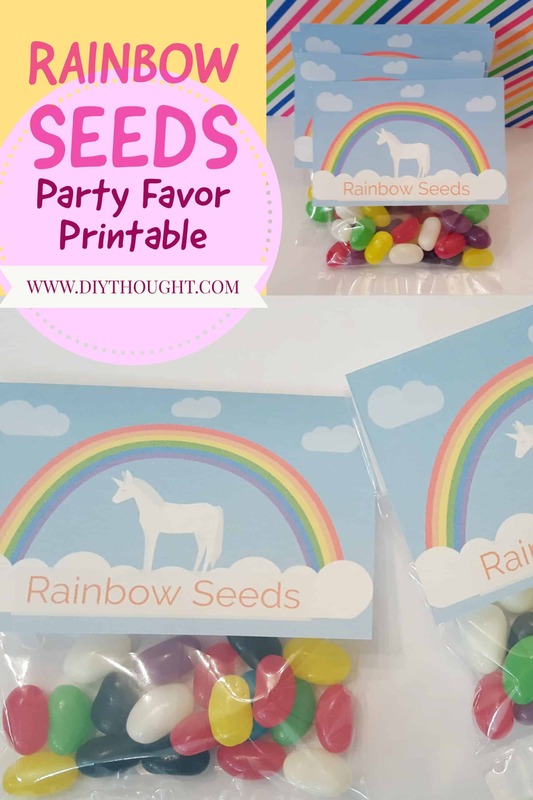 Party planning is going to be fairly easy this year thanks to the repeat of theme and thanks to Miss 6 having a unicorn rainbow party but it is always fun to have a look for exciting new ideas. 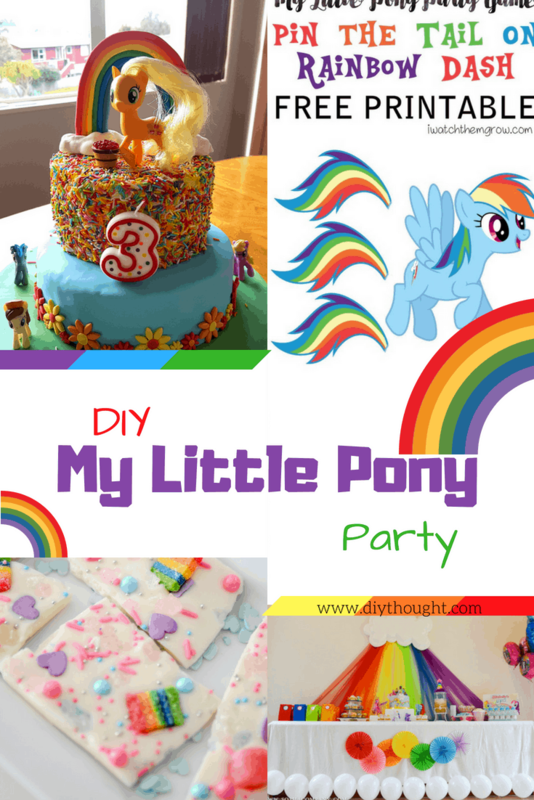 There are loads of My Little Pony ideas on the internet but it can be overwhelming and difficult to find quality ideas so here is our guide to throwing a Diy My Little Pony Birthday Party! It all starts with the invite. 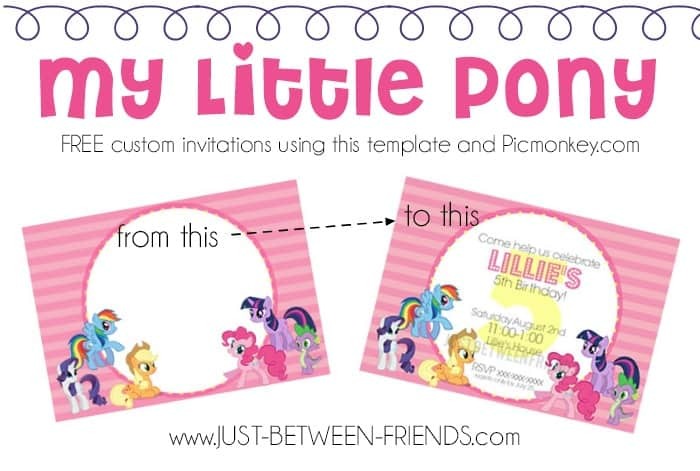 Subscribe to Just Between Friends are get this free template to make your own My Little Pony invite. They step you through the process of creating your own text to your invite, helpful if this is your first online invite! This My Little Party printable is available in both a JPEG and PDF file making in simple to either print and handwrite or add text to the invite before printing. Get the printable here. Looking for the perfect cake base then check out our 7 perfect birthday cake recipes here. 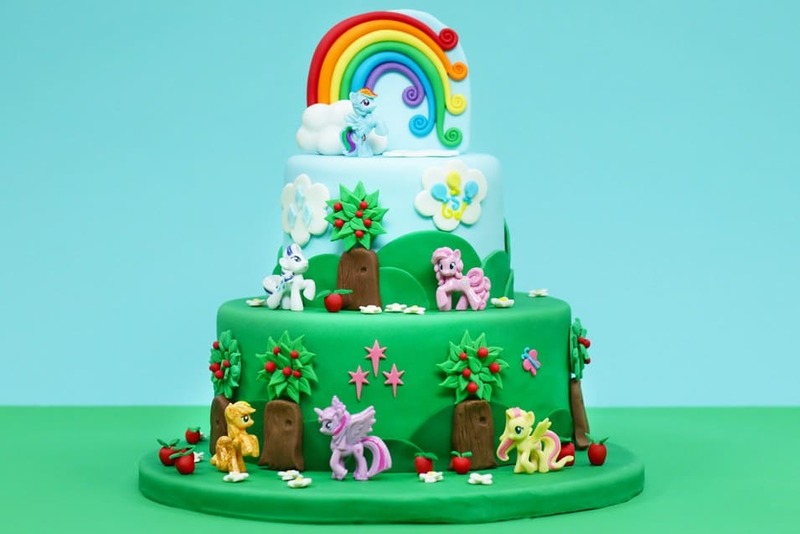 Choosing the style of the cake can be tricky but we have your pony cake needs covered here. I am no cake decorator so last year I kept it simple and made this My Little Pony cake. The flowers were made using a fondant flower cutter, the ponies all store bought and the rainbow made from fondant. 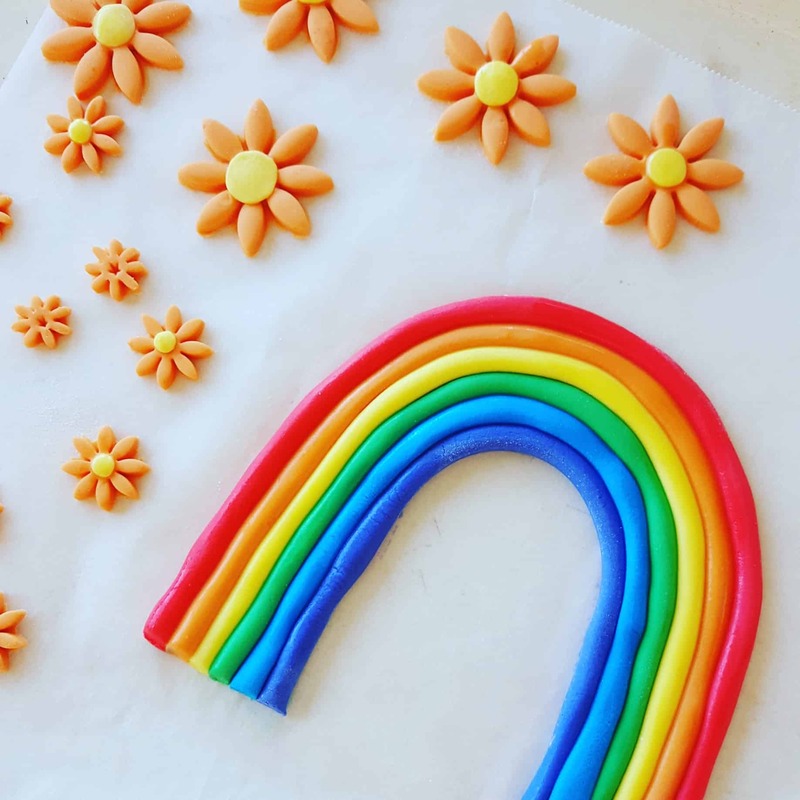 To make the rainbow roll out each fondant color into a long snake and place around a glass to get the bend. Between each color rub on some water which will help the fondant colors stick to each other. 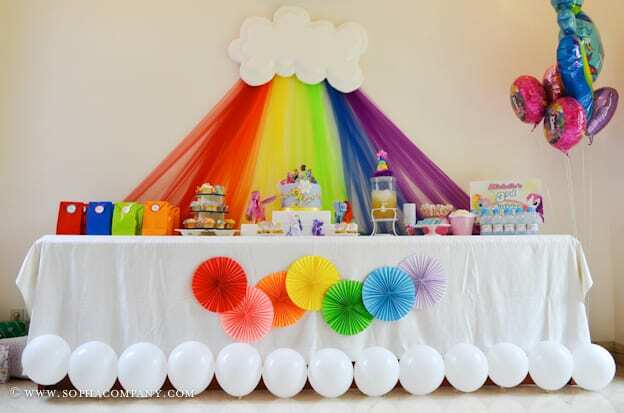 The cloud was made by rolling up fondant into balls and placing together before draping over a thinly rolled out piece of fondant and gently pressing down to create a cloud shape. If you would like to find out how to sprinkle cover a cake, click here. Our kids could sit and watch Rosanna Pansino and her videos non-stops if they were allowed so, of course, we had to feature her awesome My Little Pony Cake. Covered in fondant and adorable fondant decorations this is one cake that will impress. Head over to Rosanna Pansino to watch the video on how it was made. These fondant hearts add an interesting base design which works really well for a My Little Pony Cake. 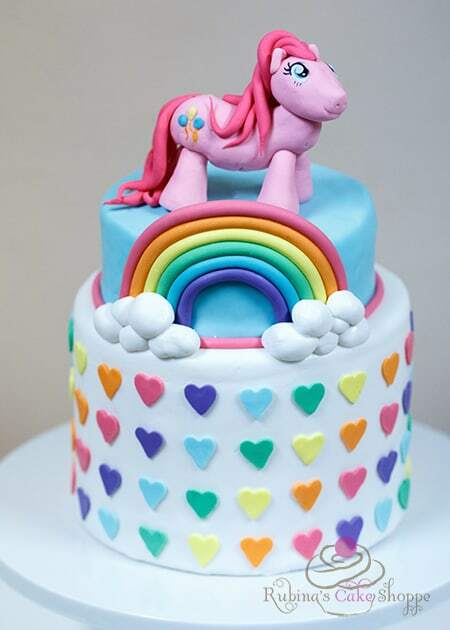 The rainbow is also lovely in this placement making the pony the feature of the cake. Read the tutorial here. If fondant isn’t your thing then you will love this buttercream meringue cake! 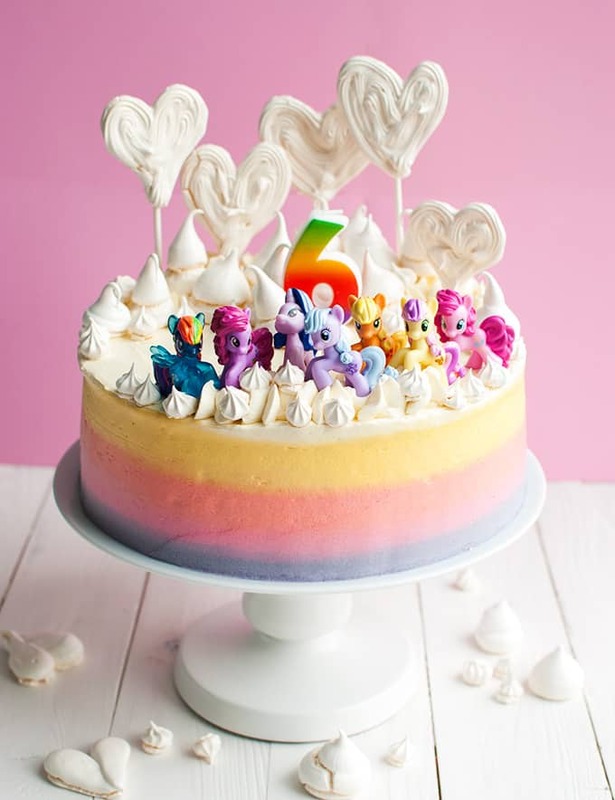 The rainbow buttercream is perfect for a My Little Pony Cake and the meringue decorations is a unique and tasty way of adding some wow factor. Click here to read the full tutorial. Every party needs some good food! 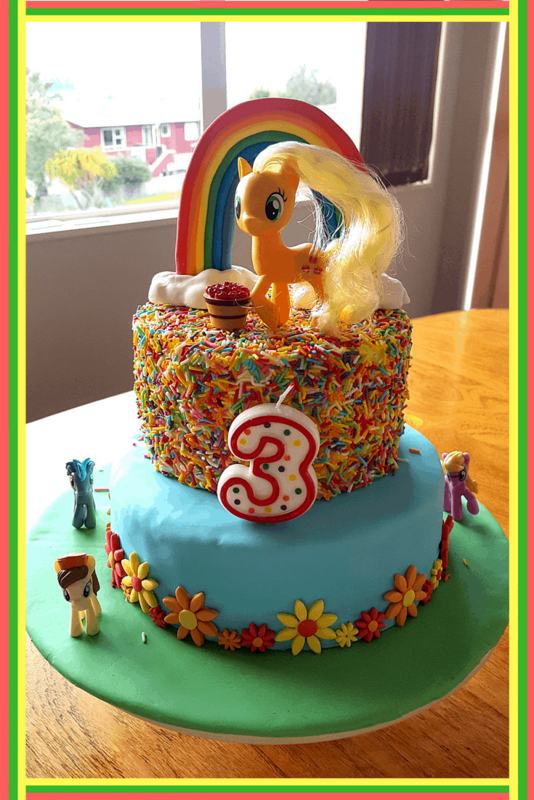 Rainbow food is perfect for a My Little Pony party! The best part is it is so simple to create amazing eye-catching rainbow food. 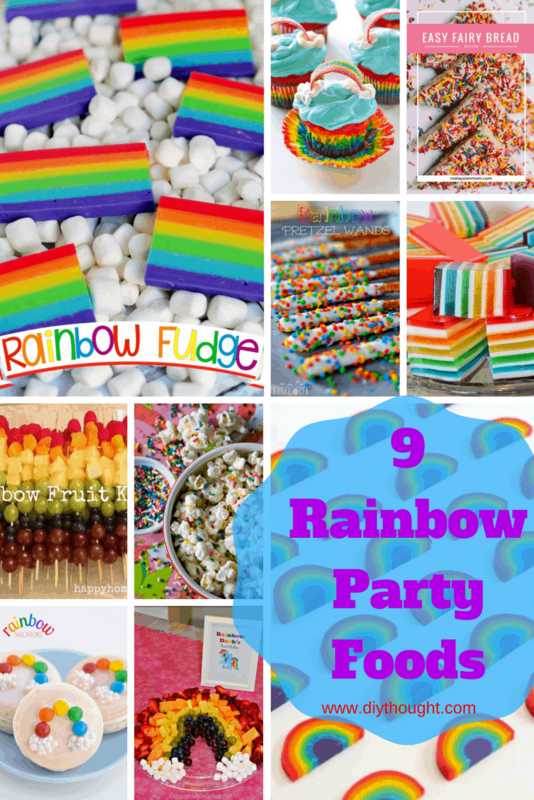 Follow this link to find our list of 9 rainbow party foods. 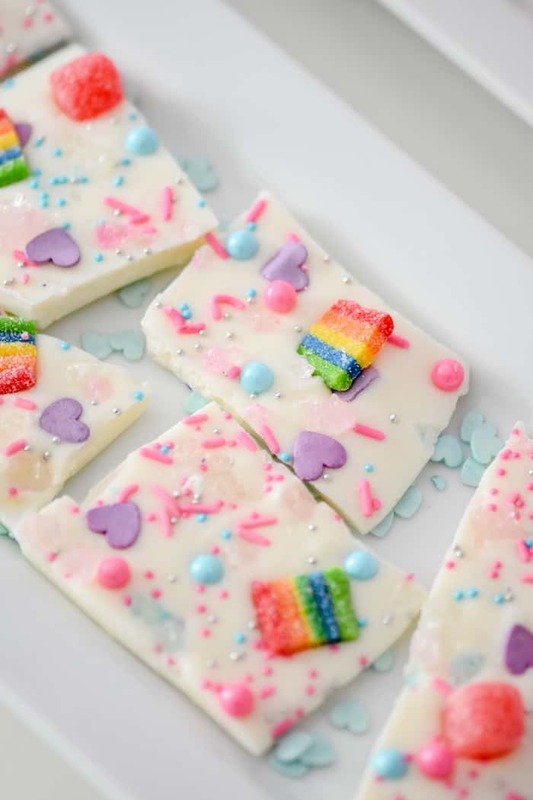 We love everything about the My Little Pony party over at Kara’s Party Ideas and especially love this Pony Bark recipe! It is easy to make and certain to keep all the guests smiling! 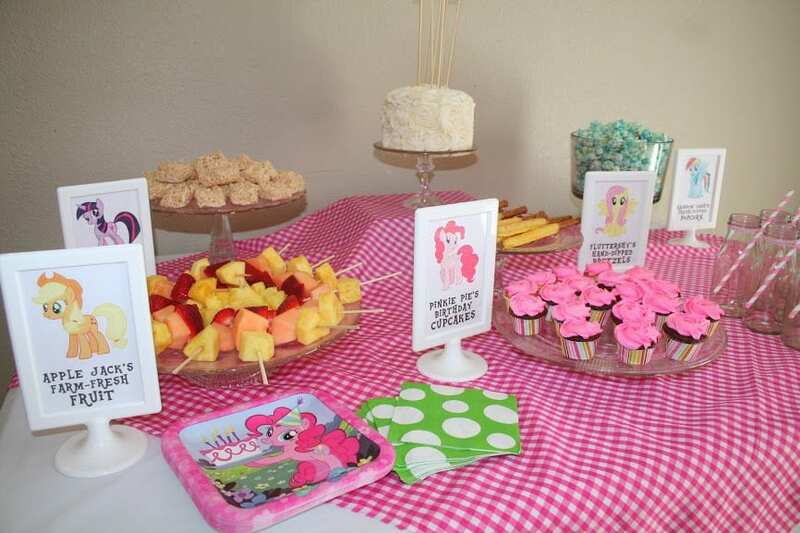 Label all of your foods with these cool My Little Pony signs. Click here to get the free printables. 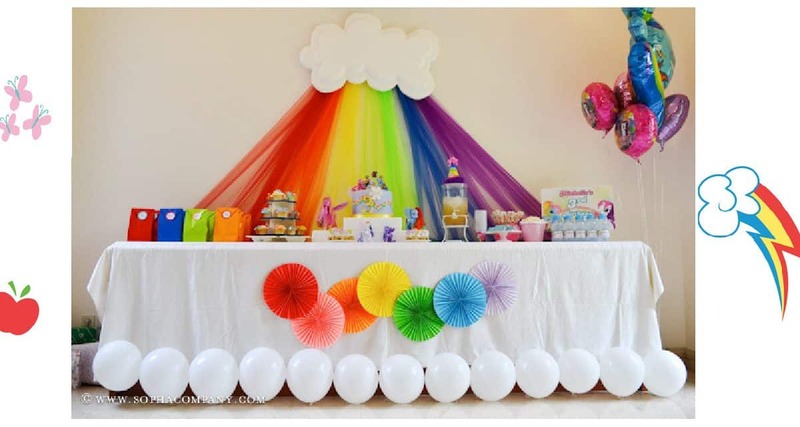 Anything rainbow will work for a My Little Pony party! Love the white cloud balloons! This is simple to achieve and looks amazing. Source found here. 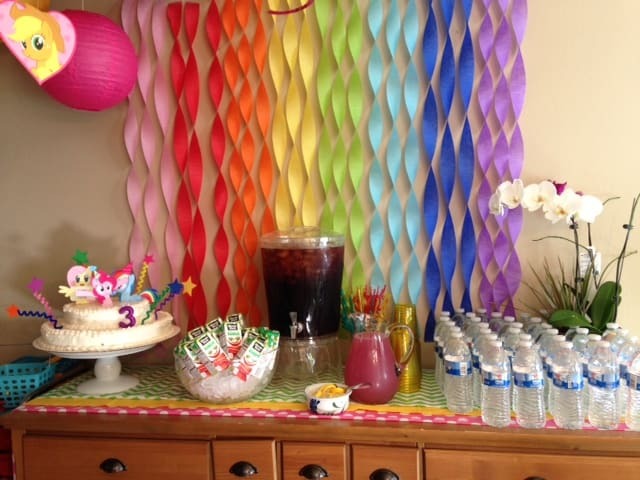 Keep it simple by hanging crepe paper for a stunning rainbow display. Source found here. Play your favorite party games and add a couple of these activities and you will have some seriously happy kids. 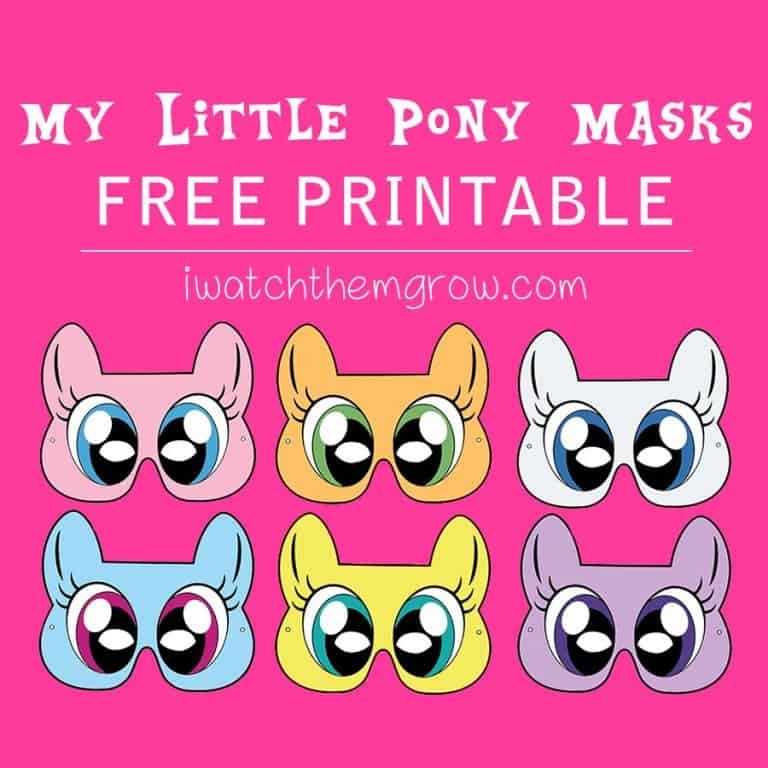 Children will love these adorable pony masks. Simply print and attach elastic! Click here to get the free printable. Get some small rocks or pebbles, spraypaint them in your favorite color and then paint on a rainbow. Once painted and dry cover in a paint sealer or varnish. 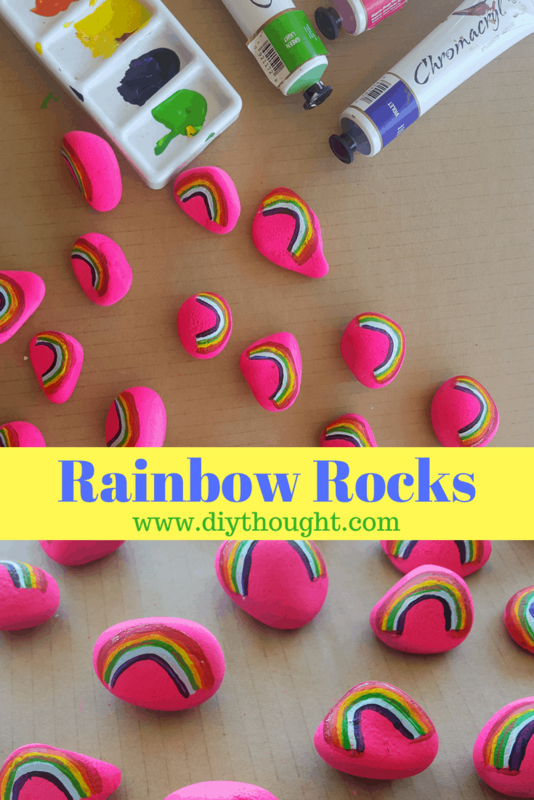 Hide them around your party venue and let the kids find their own rainbow rock. We always have coloring or activity pages printed and ready for the kids to color. This is a popular activity with the quieter children and for when kids just feeling like having a rest. 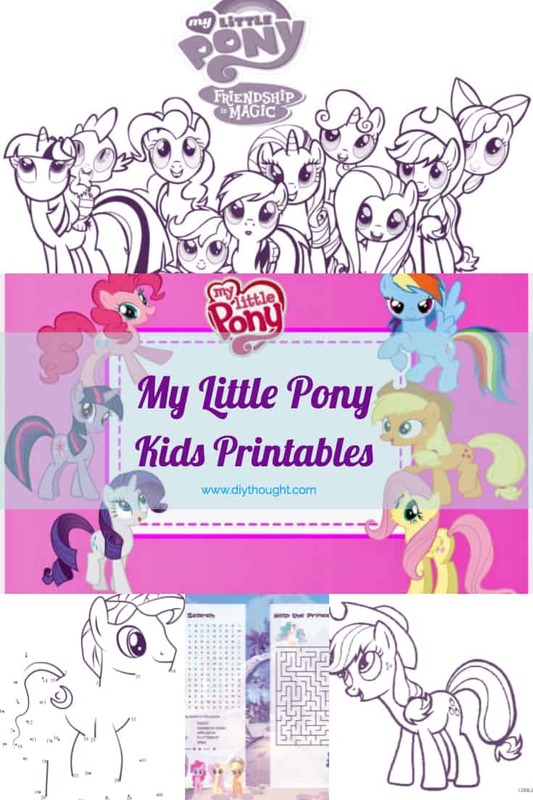 Click here to get some awesome My Little Pony printable pages. 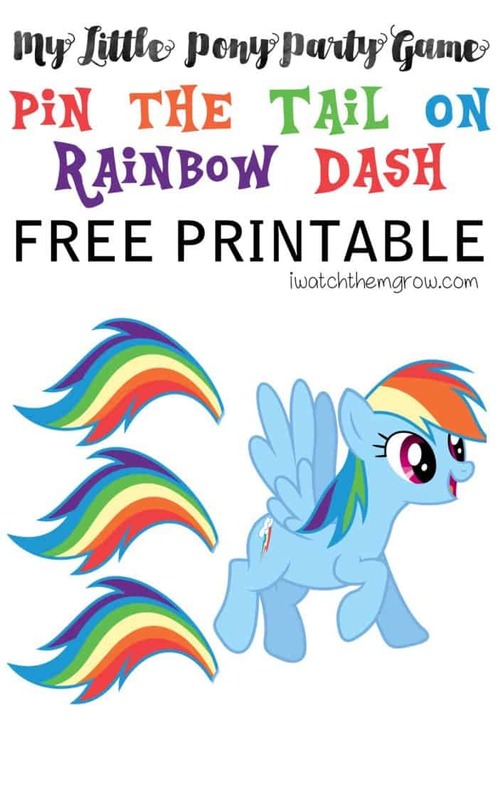 A twist on the classic game, Pin The Tail On The Donkey, this Pin The Tail On Rainbow Dash is guaranteed lots of giggles! Get the free printable here. Keep the party favors simple with one of these ideas below. 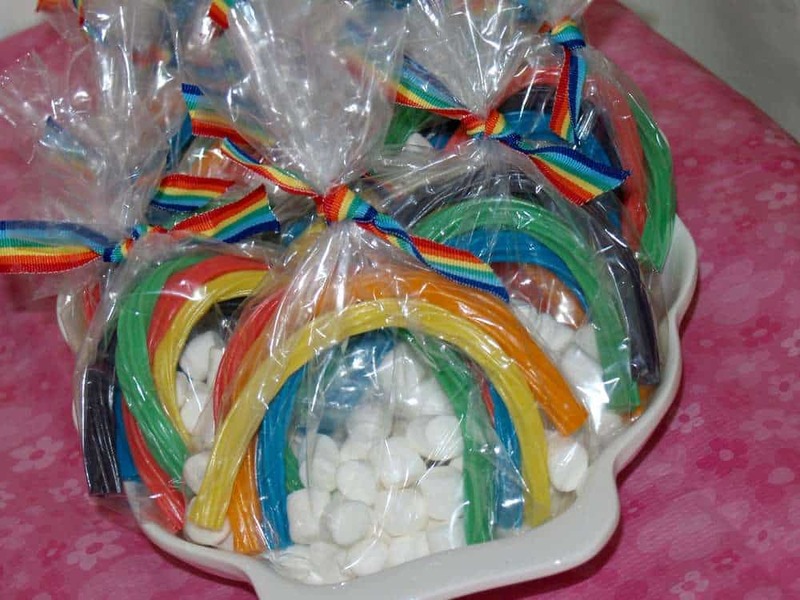 Simply print, cut out and attach to a bag of sweets for a simple and low-cost party favor. 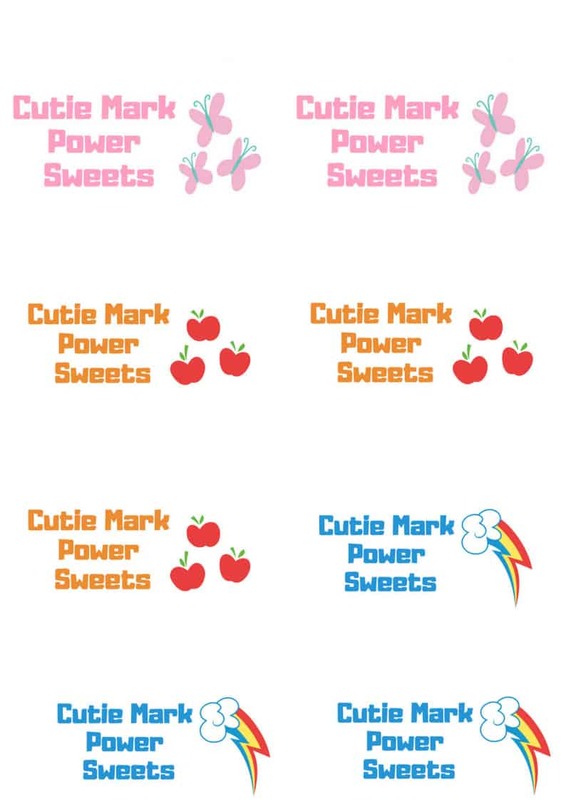 Cutie Mark Power Sweet Printable. This is the same idea as above but for rainbow seeds. Click here to get the free printables. These adorable sweet bags are a fun alternative to the printable tags. Source found here.